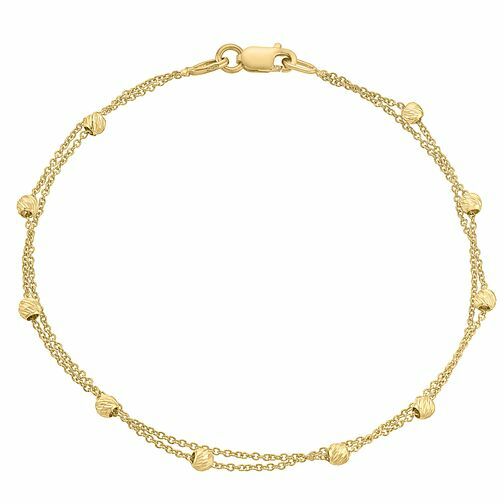 This beautiful bracelet has a double row of 9ct yellow gold chain, lined with detailed balls to add character. The perfect addition to any look, this classic accessory is the ideal choice for the woman who prefers traditional glamour. 9ct gold two row bracelet is rated 5.0 out of 5 by 3. Rated 5 out of 5 by Anonymous from The bracelet is eye-catching This is a fine delicate bracelet and the balls of gold catch the light beautifully. My daughter loves it and even though it is meant for special occasions, she has worn it since Christmas day!